Our juicing recipes that turned sickness into health. 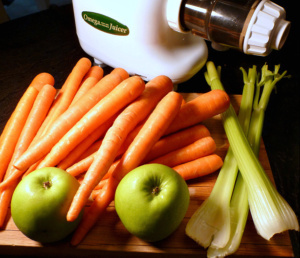 Our juicing recipes start with fresh raw vegetables and fruits processed daily in our juicer. Our recipes are simple and uncomplicated. The recipe that Barbara and I use on an everyday basis is planned with organic carrots. You will find that carrots are the basis for most healthy juicing programs. When you combine celery and apple to the carrot juice, you have one of the most powerful healing and healthy prescriptions available...and it tastes great! Carrots contain more than 490 known phytochemicals that include alpha and beta carotene. These help the immune system eliminate cancer cells in the body and also protect against free radicals. When I first started my cancer recovery diet program, I tried several juicing recipes. When I found just the right formula for taste and healing, I prepared 64 ounces of juice a day. This is the equivalent of 8 pounds of vegetables and fruit. Yes, my skin did turn orange, but this was a minor inconvenience because I didn't have to go through the horrible procedures of surgery, radiation and chemotherapy for my cancer. Refrigerate and store unused servings in 8 ounce jars. The tartness of the Granny Smith apple reduces some of the sweetness of the carrots and produces a synergistic effect when combined with carrot juice, according to the Gerson Institute. 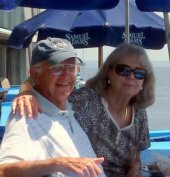 They have been making vegetable juice a major part of their disease recovery protocol for over 30 years. The Gerson Institute starts you off with thirteen 8 ounce glasses of fresh vegetable juice each day. That will get you going! A planning tip: I use a 25 pound capacity kitchen scale to break down my 25 pound bag of carrots into 7 parts, bag them and refrigerate until needed. The weighing idea is more accurate since carrots vary in size. We use this recipe every now and then. Beets are very powerful when it comes to cleaning out the liver and kidneys. This provides a variation to the basic recipe. In addition to spinach, the cup of greens can be any fresh and raw greens such as kale, mustard greens or collards. These few juicing recipes are the ones that sustain us on the path of health. I don't add a lot of fruit to our recipes because I recommend that you eat most of your fruit and get the benefits of the fiber that the body needs to function properly. If you are diabetic or have any other medical sensitivities, you may have to consider reducing the amount consumed of our recipes. Some individuals dilute the carrot juice by half with distilled water. Carrot juice contains about 12 grams of sugar and 18 grams of carbohydrates per 8 ounce serving. Not a very large sugar load when compared to an apple, orange or banana. There are hundreds of juicing recipes in books and on web sites. I don't feel compelled to list the many juice formulas that I have reviewed over time. The basic recipe can be modified to suit your palate. I suggest that you try our basic recipe and branch out from there. Tomatoes, cucumbers, celery and a little bit of lime juice may be appealing to you to create a V-8 taste, or you might consider adding cruciferous vegetables such as cabbage, broccoli, cauliflower and brussel sprouts. You will not go wrong in juicing any of the fresh vegetables that you choose. The taste of green juice by itself is difficult to get used to. We do not juice greens on a regular basis. We use a green powder made from juice that is processed to maintain the nutrients and the enzymes. It is the ultimate fast food. When you find the juicing recipes that suit your palate, and start consuming them on a daily basis...you will probably wonder why you didn't start before now. The energy and well being that comes with juicing will be something that you won't want to give up...it is just that good! Best Juicer - Deciding which is the best juicer for you is an important first step in getting healthy and staying healthy. Samson Juicer - This high quality, affordable, easy to use machine makes juicing a pleasure. There is a 15 year full manufacturer's warranty on motor and operational parts. Shipping is free!